This 6ft Soul Taker figure is one of our fantastic Horror themed models. Ideal for using in any spooky setting this Grim-Reaper statue comes equipped with his replica sythe. 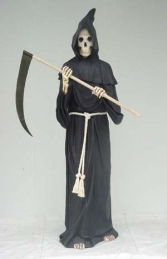 This skeleton Soul Taker model in his hooded, black monk's cowl has been used by a wide range of customers from Ghost-Trains, Fun-Fair rides to Fancy-Dress shops. Our Grim Reaper is a great figure to give a menacing atmosphere to a horror themed area. This model is also availabe in a 3ft version.